I am totally excited about the book I am reviewing (and giving away!) today! I usually review ordinary cookbooks, but today I am reviewing something kind of different. Because of that, I am not going to do my regular set of cookbook review questions, but let me tell you about this fabulous book. I still remember the first time I discovered Bridget Edward’s blog. My jaw dropped open further and further as I clicked for another page, and another. The woman is insanely talented, and has the most fabulous cookie decorating ideas! When I heard she was coming out with a book, I knew I had to get my hands on it. And this book didn’t disappoint. Decorating Cookies starts out with a section on cookie decorating supplies, such as icing tips and squeeze bottles, moves on to specialty decorating supplies, such as gel paste food colors and luster dust, then moves on to royal icing basics such as outlining, flooding, piping straight lines and making dots. Next the book has a section with recipes for cookies and royal icing. I have always used plain old cookies for decorating, but thanks to Bridget I am thinking that my next set of decorated cookies will be chocolate hazelnut flavored. Or key lime pie flavored. Or maybe gingerbread flavored. I just love these options! After the recipes, there’s a trouble shooting section where the author elaborates on various problems people have when decorating cookies. And then the book goes on to the main event, which is the step by step guides to creating 60 gorgeous cookie designs. One of the many fabulous things about this book is the pictorial index in the front, where instead of just naming the cookie styles, there’s a small picture of each one, to make it easy to find the one that fits your situation. The book starts with some fairly simple designs, like sparkly heart cookies, then moves on to more complex designs like cherry blossom cookies and beer and hot dog cookies(!). 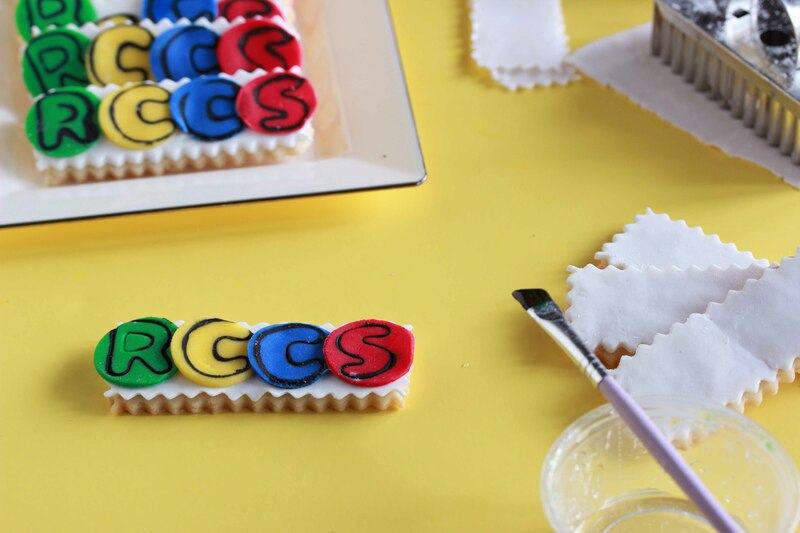 There are cookie designs for various occasions such as adorable crayons and rulers the first day of school (or the last?). I am totally in love with the edible coupon cookies, which would be the ultimate party favor! You kinda knew a picture of these was coming, right?! Who this book is for: I think this is an absolutely fabulous book for anyone who is either a cookie decorator, or wants to learn to decorate cookies. As I have mentioned, this book really includes all of the information, recipes and overall guidance a person needs to get started on their cookie decorating journey. 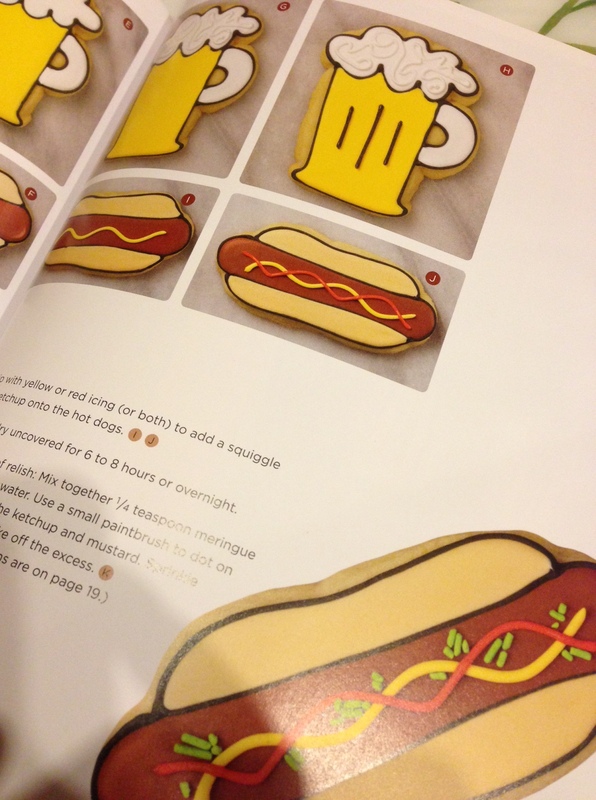 Who this book isn’t for: I think it’s obvious, but this book is really only for people who want to decorate cookies. Sure, there are a couple of recipes in the beginning of the book, but you won’t be buying this book for those few recipes. Also, this book has excellent and clear directions, but I do think a certain level of patience and ability is required as a prerequisite to making really professional looking cookies. While there are menorah cookies in this book, I do want to point out to my Jewish readers that a number of the cookie styles of for non Jewish holidays and events, particularly Christmas. One final thing I want to point out about the book is both a good thing. The book is amazing in terms of inspiring creativity for your own cookie creations, as well as learning techniques to apply toward your cookie designs. However, I do think that some people (who are perhaps less creatively inclined) will have a hard time veering from the exact designs in this book. In Conclusion: If you want to learn to decorate cookies, or improve on your cookie decorating skills, buy this book. Simple. Scroll down to the bottom of the post for a chance to win this book! Now, for a life changing decorator’s cookie recipe! Why life changing, you ask? Simple. This dough does not need to be refrigerated before being rolled out! If you aren’t as excited as I am by that prospect, you obviously never found yourself staying up way too late for your dough to chill so you could bake cookies. Oh, and everyone was super impressed by how delicious these were, even just plain! In the bowl of an electric mixer, cream together the butter or margarine and sugar until combined and fluffy. Beat in the egg and extracts, beating until combined. Add the flour mixture, one third at a time, mixing on low speed until just combined. Scrape down the sides and bottom of the bowl to make sure everything is incorporated. On a lightly floured surface, roll out a portion of the dough to about 1/4 of an inch thick. Cut as many shapes as you can with your desired cookie cutter, and carefully transfer them to the prepared cookie sheet. Reroll the scraps to cut out more cookies. Remove cookies from the freezer and immediately bake at 350 for 9-12 minutes. It can be a bit more or less, depending on size and thickness of the cookies. Set aside to cool completely before decorating. Repeat with remaining dough, until all dough has been used. Now, let’s talk decorating! I didn’t do one of Bridget’s patterns from her book, but she inspired me to get creative and create these personalized name cookies. 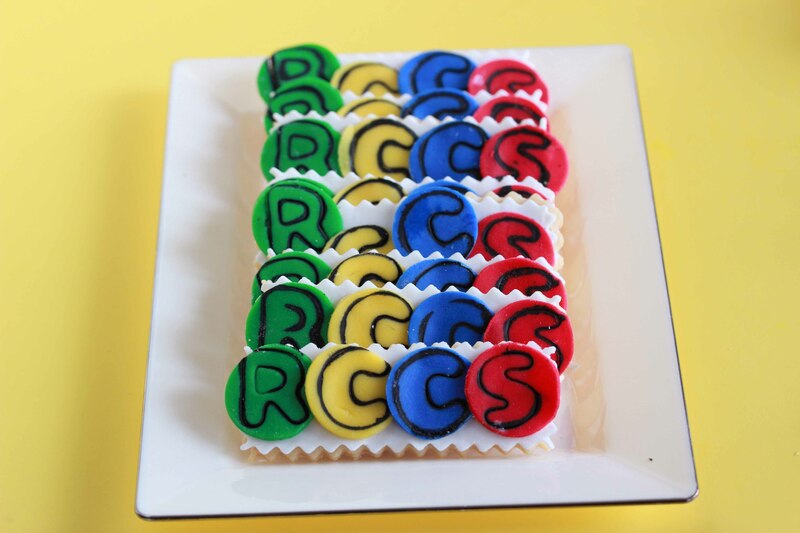 I made these for a charity event for an organization called RCCS, but you can customize these completely, by changing the shapes, colors and letters you use. 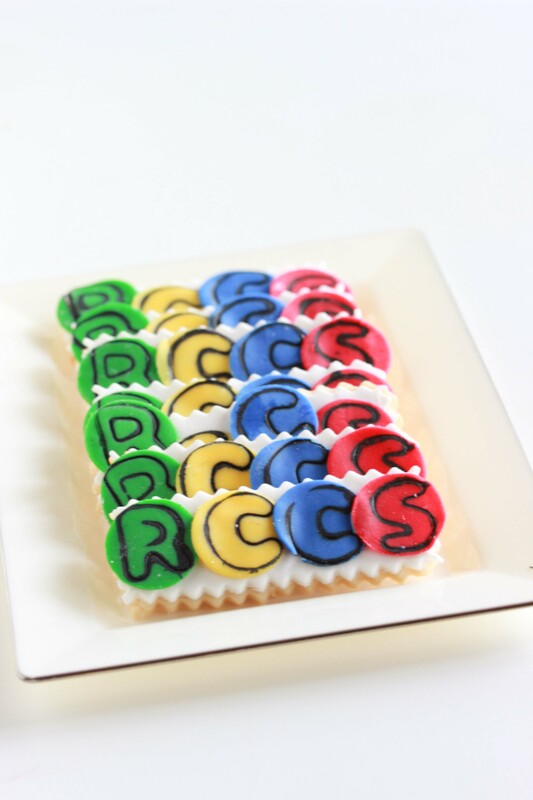 These are a lot easier than they look…thanks to fondant! Two tips to working with fondant: it will get sticky, so roll with confectioner’s sugar- not flour! 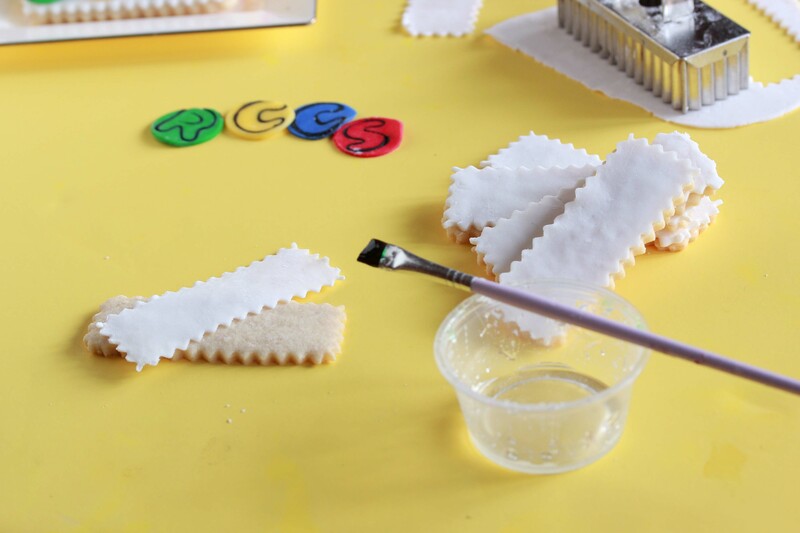 Also, use a plastic fondant roller rather than a wooden rolling pin for the smoothest look. Now, lets talk about how to make these cookies. First, chose a cookie cutter, any cookie cutter. Bake up a batch of these delicious cookies shaped to your liking. Next, choose a base fondant color. I picked white, to show the primary colors nicely, but you can pick whatever fits your theme/color scheme. Roll out the fondant really thin (about an 8th of an inch) and cut it out using the same cookie cutter you used for the cookies. This will form a fondant top for the cookies that is exactly the same shape. Use a food safe paintbrush to paint light corn syrup thinly over the entire surface of the cookie. Carefully smooth the fondant topper over your cookie, pressing slightly to adhere. Put it aside to set. Meanwhile, prepare your letters. (Or designs. Or whatever.) First, choose a color that will work nicely with your theme, color scheme and base color of your cookie. My party has a primary color scheme, and a “twister” theme, so I chose primary colored circles. 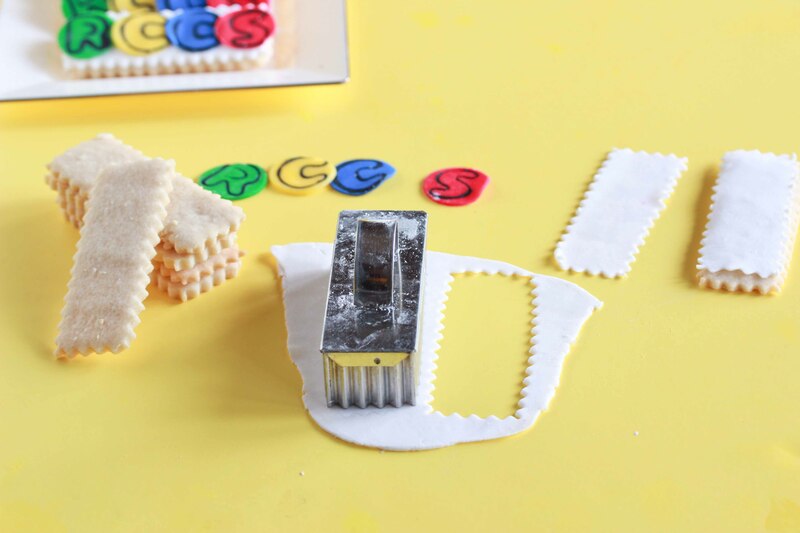 You will need to find a good size and shaped cookie cutter for the letters. My cookies were really small, so I brainstormed and raided my decorating box and came up with the fat end of a Wilton 1M piping tip. It worked perfectly as a fondant cutter, and the size was exactly perfect. Roll out your colored fondant, the same as you did with the base color. Cut the smaller shapes (circles, in this case) out of it. You can choose to use a number of colors, like I did here. Next, mix together equal parts food coloring and clear flavor extract, then dip a stamp, or in this case I used another fondant cutter, in the mixture. Press very gently into the circle. If using a cutter, you have to be extra careful to make sure you don’t cut through. Set aside the circles to dry completely. Again, using the paintbrush and corn syrup, paint the back of the circle, then press it onto the fondant topped cookie and press to stick it on. Now- for the giveaway! For your chance to win Decorating Cookies Giveaway now closed! Entry #1 – Leave a comment on this post telling me about something fun you have decorated. Giveaway ends at 11:59 PM on Thursday, December 27th. A valid email address or twitter profile must be provided. Giveaway is open to residents of the continental US. Disclaimer: The publisher sent me a copy of this book to review, free of charge, and is also sponsoring the giveaway. All opinions expressed in this review are my own. There are affiliate links within this post. I decorated beautiful cookies for my grandson’s Upsherin – Yarmulkes, scissors, 3s and others. I enjoy decorating cakes; faster than cookies, but this book makes me inclined to think cookies! I decorate cakes and cookies. Fav cake, was my daughter’s third birthday cake. I decorate cookies for shalach manos every Purim – jester’s hats, bandaids, chickens, rabbits & more. I also decorate cakes for my kids’ birthday parties. Awesome! I think I’m gonna make these for a sem reunion! I decorated a very pretty birthday cake. I subscribe to your blog. Btw, the cookies look really really pretty!! My boyfriend and I did some gingerbread men this year – although he was a bit evil and made them scary gingerbread men! NOT appropriate to send to young relatives! I know nits not cookies but I like to decorate deli platters !! I receive your emails and liked you on facebook I enjoy everyone of your blogs thank you. I recently decorated cookies for Chanukah – per my son’s request there were Maccabees holding knives/swords as well as dreidels, mehorahs, and stars. and I currently have dough chilling to make alef-beis cookies for my son’s upshiren. I spend my days decorating cookies, so I’m a huge fan of bridgets. Some of my fave designs have been, the Simpson’s, star wars charachters and I always love doing wedding themes. great book!!! would love to win this! I love the cookies, they are so colorful. I decorate birthday cakes for everyone in my family and a few friends. I have to resist making my own cake. My birthday is coming up in a week and my daughter now does such a cute job. i decorated really pretty cookies for chanukah! Mostly.. I like to bake and let the kids decorate. Thanks for the cookie recipe! I’ve done fondant cookies before but gave up on them because they don’t have a great taste or smell. Icing is much better! I started following you on fb. I decorated adorable bob the builder themed cookies and an amazing bob the builder cake for my sons 4th birthday! He was SOOO excited when we showed him!!! And I had a blast doing it!! I once decorated a b-day cake. Was fun! i did a sugar decoration on top. I love decorating cookies, was up till three in the morning yesterday doing so 🙂 Thanks for a great giveaway! for my son upshirn i have decorated cookies and cakepops ect.. I just made cupcakes with cute chanukah themed toppers. i’m a beginner at cake/cookie decorating so i’m starting small with cupcakes – looking to learn more! My first “real” decorating experience happened when I saw a 6 layered rainbow cake and HAD to try it. I made it for my daughter’s 2nd birthday and I was quite pleased with myself 🙂 Since then I have wanted to do so many things, I’ve tried cookies so many times but just don’t “get it”. I’d love to win this book to help me!! You just got a new Twitter follower! I already get your emails! Thanks for this opportunity! made cookies with fondant for the first time ever for my sons upsherin and was 9 months pregnant! already get your emails 🙂 now can i win? I subscribed to overtime cook via email ! So I want to actually want to start my own cookie/cupcake decorating company. I love decorating Chanuka cookies, and any cookies throughout the year. I would Love to have this book !!! I decorate cookies and cakes as a hobby (when I have the time- not that often). I recently made a mitzvah train cake for my son’s upsherin along with tzitzis, yarmulka, and torah cookies. I’ve always decorated fun cakes for my kids (and friends’ kids) birthdays and other special events. Can’t wait to do some cookies! I made my husband a cake that looged like a keg of beer. I decorated cupcakes for my Purim theme. I decorated a birthday cake for my niece using buttercream and covered the whole cake in big roses. Signed up for your email list. You were recommended to me by my sister. I actually enjoy decorating cookies. Patience I have. Time, I often do not! I also find that the “real” decorating supplies can be expensive, and end up resorting to whatever can be made out of confectioners sugar, chocolate chips, and food coloring! Recent decorating . . . I “drew” blue smiley faces onto sugar cookies with icing for a Bris. I painted the bottom of the cookie in glaze and dipped into blue sugar. I Have decorated dolphin and shark cookies for Purim one year and made adorable chick cake pops for Purim last year! Would love more tips on decorating cookies!! I already Like Tales of an Overtime Cook on Facebook! Just Subscribed to OvertimeCook via email! I love to decorate cakes – not with fondant, but with fun decorations and icing. I don’t have Pintrest, FB, or Twitter, but I follow your blog. 🙂 Now what? I decorated clown cookies for purim with my 4 year old sister in law. They came out so cute! I follow you on facebook and I signed up for your newsletter. (I don’t have twitter or pinterest). I love your recipes!! I love your cooking and baking tips so much!! I enjoy decorating my kids birthday cakes. I’m already a fan of overtime cook on facebook. I already get the overtime cook email newsletter. i love decorating anything and everything! 5x a year I make personalized decorated cakes for my kids & hubby for their birthdays. I’ve made a castle, puzzle pieces, Elmo, Dora, barney, Strawberry Shrotcake, Baseball field, Uncle Moishy & many other cakes. I am now following you on Pinterest & I liked you page on facebook. I decorate cake and cookies. What a fun giveaway! I would love this book! I just decorated Christmas tree cookies with my niece and nephews and it was so much fun! The last thing i decorated was the manischewitz chanukah house with my kids!! Love decorating all cookies! Favorite are Chanukah cookies!!!! I follow you on twitter and always love your features in the ami magazine. The most fun I had decorating cookies/cakes was a Mario cake for my 7 y/o’s birthday. He was smiling so wide, and he told me it was his best birthday EVER! I made this cookie recipe two nights ago and all I got was a bowl of crumbly dough that fell apart when rolling. I followed the recipe to a tee. I don’t get what happened. It also tastes very commercial and bland and can use a tsp or so of salt. I suggest using 2.5 cups flour and adding a tsp of salt.